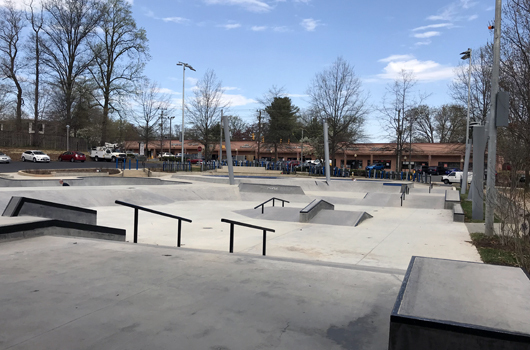 Powhatan Springs Park features a concrete Skate Park, rectangular athletic field, Children’s Rain Garden, public restrooms, drinking fountain and parking. 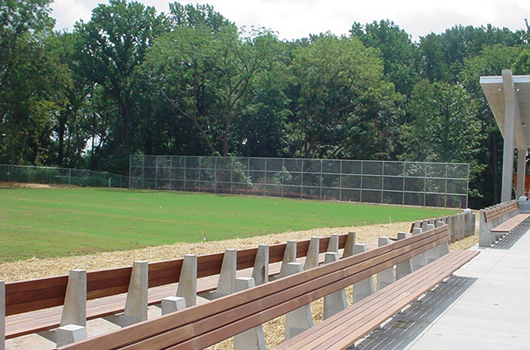 The athletic field is intended for use by youth and is a permit takes priority field. The Children’s Rain Garden combines a children’s learning experience and a bioretention area into a single element of the park. Bioretention cleans stormwater runoff through a man-made wetland or “rain garden.” The flow and collection of rainwater is exposed and animated to emphasize collection and placement of water into the bioretention system. Water Vessels, designed by artist Jann Rosen-Queralt, collect rainwater from the roofs of the park buildings and slowly release it after a rainstorm. Raindrop System. Drops of water are released from pipes on the restroom building a few minutes every hour on the hour. Children can play in the water drops, collect them or run through them. Wall Embedments. The concrete wall surrounding the Children’s Rain Garden is embedded with wood that will decay and leave behind impressions of the trees they were taken from. Construction of the Children’s Rain Garden was made possible by a grant from the Kiwanis Club of Arlington. The park is named after a spring in the southeast of the park, itself named after Chief Powhatan, a Native American chieftain from the Tidewater area, whose rule extended as far north as Arlington. Chief Powhatan was father to Pocahontas.